The so-called congressional "super committee" got to work this week, beginning its task of finding trillions in budget savings. Sharing the halls of Congress with those "supers," the defense contracting industry also got down to work this week, in a full-court press to convince Congress to cut spending anywhere but in the Pentagon. Charged with finding at least $1.2 trillion in savings before the end of Thanksgiving, the "super committee" could influence the course of government policy, economic growth and the overall national trajectory for at least a decade. The group of12 promises to put scrutiny on every "sacred cow" in Washington, from Medicare to defense. With that kind of power, it's no surprise that corporate lobbyists are gaming for access to super committee members. 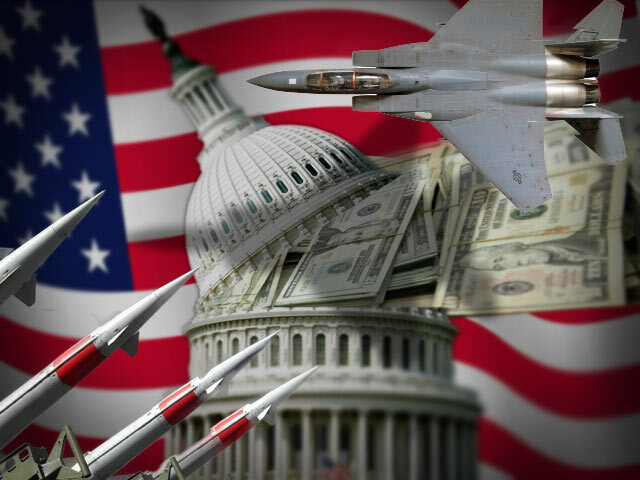 The defense industry in particular has much at stake -- if the super committee fails to agree to a plan for $1.2 trillion in savings, it will automatically "trigger" certain measures into effect, including $600 billion in defense cuts. Already this year, the Budget Control Act -- the debt ceiling deal that spawned the super committee -- puts Washington on track to cut $350 billion from the defense budget over 10 years, in the first defense cut since the 1990's. More cuts this year to the Pentagon seem inevitable, but defense contractors say that doesn't have to be the case. "Defense has been cut into the bone, and we cannot have that continue," Marion Blakey, president of the Aerospace Industries Association (AIA), said at a press briefing this week. "As far as defense is concerned, the cuts have been taken that could be absorbed." Perhaps fortunately for AIA, some of its strongest allies sit on the super committee. The group's co-chair, for instance, is Democratic Sen. Patty Murray, who represents Boeing's home state of Washington, is a founding member of the Senate Aerospace Caucus, and a member of the Senate Appropriations Defense subcommittee. But defense contractors are looking past Murray, crafting a message for an entire Congress that's itching to slash budgets, as well as a war-weary nation. Cut $600 billion from their industry, say companies like Lockheed Martin and Northrop Grumman, and nothing less than America's economic strength and national security would be at risk. "If we had additional cuts of $600 billion ... I would question whether or not we will have a fighting force that's capable, or an industrial base left," Jim Albaugh, president and CEO of Boeing Commercial Airplanes, said at the AIA briefing. AIA took that aggressive message to Capitol Hill this week for National Aerospace Week, an event established by Congress that happened to fall on the week the super committee was getting to work. During National Aerospace Week, representatives from Boeing and other big-name defense contractors were on the Hill holding policy luncheons, hosting exhibits and meeting with members of Congress and staff to show off their industry's strengths. On Tuesday, after the super committee held its first public business meeting, the Aerospace Industries Association presented Murray with its "Wings of Liberty" award to honor her advocacy for their sector. The AIA said the decision to give Murray the award was made long before she was appointed to the super committee and was intended to honor the four-term senator's longtime service to the industry. The industry has given more than just awards to Murray; she received $195,810 in donations from the defense industry for her 2010 election campaign. Just three other Senate candidates received more. Left behind: Why are rich and poor so far apart? Murray's office says the senator's advocacy isn't about catering to a deep-pocketed special interest, but about protecting a sector that employs a significant number of her constituents. "Senator Murray has fought for American aerospace because it provides good, family-wage jobs for workers in Washington state and across the country," said Matt McAlvanah, a spokesman for the senator. That doesn't mean defense cuts are off the table, McAlvanah added. Murray "has also been clear from the moment that she was named to the Joint Select Committee that a bipartisan, balanced solution is going to include some things that will be difficult to swallow for everyone," he said. "Balancing the unique needs of the aerospace industry, the jobs it creates, and proposed cuts will - like so many of the serious issues facing this committee - mean tough choices for Senator Murray and all the other members." With such stern words from one of their biggest supporters in Congress, the AIA doubled down and launched a campaign called "Second to None" to educate all lawmakers and the public at large about the aerospace and defense industry, which the firm Deloitte says supports more than 1 million direct jobs and 2.9 million American jobs overall. In unveiling the campaign this week, Blakey said that further cuts to the industry pose a "deep risk to our national security and our economy," with the potential to kill "hundreds of thousands" of American jobs and "decimate" research and development that's critical for the defense, air and space industries. Blakey said AIA decided to launch its "Second to None" campaign before the super committee was formed, since it was clear much earlier that Congress was ready to start making significant budget cuts. The group is busy meeting with as many lawmakers as possible, including super committee members like Murray, Rep. James Clyburn, D-S.C., and Sen. Pat Toomey, R-Penn. "It's hard to tick off all of the members we're engaging with," Blakey said. "People are listening very closely." Some opposed to the United States' ongoing military operations are concerned Congress is listening a little too closely. The liberal group Brave New Foundation, which earlier launched the initiative "Rethink Afghanistan," launched a new campaign this week called War Costs to counter the AIA's "Second to None" campaign. The deficit discussion in Congress right now, the War Costs team argues, "is a zero sum game, pitting military spending against the exact kinds of spending that would create more jobs." The group points to research suggesting government funds could more efficiently create jobs in sectors like health or education, as well as a study indicating the defense sector has inflated its significance in terms of jobs. Other groups, meanwhile, have been more concerned about the influence special interests in general will have on the super committee. One liberal group zeroed in on Murray's role as super committee co-chair not because of her ties to the aerospace industry, but because she is chair of the Democratic Senatorial Campaign Committee. The group asked Murray to step down from that role, which makes her one of the chief fundraisers for the Democratic party, while she's serving on the super committee. It's unlikely the super committee members will stop fundraising while they search for budget savings, but lawmakers from both sides of the aisle have at least called for more transparency -- Sen. David Vitter, R-La., introduced the Super Committee Sunshine Act, for instance, while a bipartisan group in the House introduced the Deficit Committee Transparency Act.